January is coming to an end but for some of us the New Year stress still lingers. But now Rick Hay, a London-based nutritionist, has revealed three natural ways of dealing with stress. In a piece for Healthista, he explained how drinking green tea or lavender, and snacking on nuts, could help. 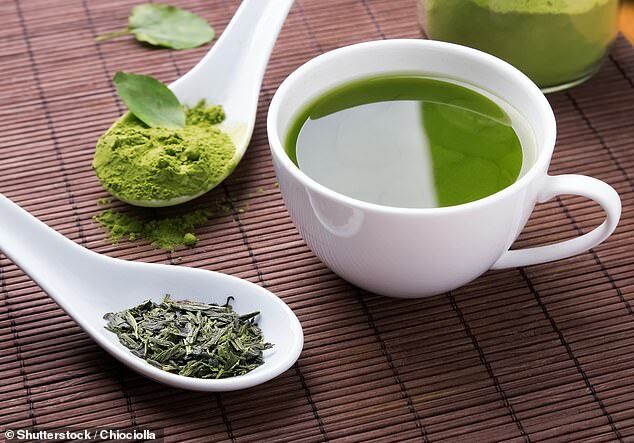 L-theanine is an amino acid found in green tea, black tea, and white and matcha green teas. In 100 grams of matcha, there are 2.41milligrams of L-Theanine – five times more than typical black and green teas. It’s believed to enhance sleep and help reduce anxiety and stress. ‘Certain amino acids found in teas can help with sleep by nourishing the nervous system’, says nutritionist Rick Hay. L-Theanine helps increase alpha waves in the brain (these are brainwaves that promote relaxation). This causes feelings of relaxation, maintains mental alertness and improves the quality of your sleep, without causing daytime drowsiness, according to a 2008 study published in the Asia Pacific Journal of Clinical Nutrition. Stressful jobs cause women to pile on the pounds later down the road – but not men, research suggested earlier this month. A study of more than 3,800 people found women who struggle to cope with their workloads or feel they have little control over their careers are more likely to gain weight over the next ten-to-20 years. Feeling overwhelmed at work may demotivate women, making them more likely to be lazy or overindulge in fattening foods, the researchers – from the University of Gothenburg – claim. Stress also triggers the release of the hormone cortisol, which helps ‘lay down’ fat around the midriff, leading to ‘muffin tops’, they add. Women may be more affected than men as they often juggle ‘job demands and the greater responsibility for the home’. The study examined the brain activity of healthy adult participants after they consumed L-theanine and found it increased alpha brainwave activity. It showed evidence from EEG (human electroencephalograph – which is the instrument used to measure brainwaves) readings that L-Theanine had a direct effect on the brain and relaxed the mind of study participants. L-theanine has also been found to help young boys with Attention Deficit Disorder (ADHD). In a 2011 study published in Alternative Medicine Review, 98 boys aged eight-to-12 were given 400mg of L-theanine daily for six weeks. Results showed their ADHD-related disturbances were significantly reduced. This stress-busting amino acid can also help to reduce psychological and physiological stress responses too, such as heart rate, according to a 2007 study. L-theanine, when taken together with chamomile, has been said to reduce salivary cortisol levels (a stress hormone that is found in saliva). It can also increase both serotonin and dopamine levels (your feel-good neurotransmitters), which will better your mood, decreasing stress. Have you found yourself struggling to fall asleep due to a racing mind that’s stressing over the day’s events? Unfortunately this can become a vicious cycle. You can’t sleep because you’re stressed, but you’re also stressed because you can’t sleep. Lemon balm is a member of the mint family. Similar to lavender, lemon balm is used in fragrances, cooking and herbal medicines. The flowering herb is used to produce an essential oil and its leaves can be brewed to make a fragrant tea. It’s used in traditional medicine to treat insomnia, depression, anxiety, migraines and gastric conditions. ‘A gentle lemon balm tea an hour before bed can help to relax and de-stress you,’ says Hay, this will help you fall asleep and therefore feel less stressed the following day. The herb lemon balm helps to reduce both stress and anxiety by increasing the feel good neurotransmitter used by the nervous system known as GABA (Gamma-Amino Butyric Acid). Cyracos lemon balm extract can promote a 18 per cent reduction in anxiety symptoms, 15 per cent in stress and 42 per cent in insomnia within two weeks, according to a study published in 2011 in the Medical Journal of Nutrition and Metabolism. Taking ‘Cyracos lemon balm extract may be a viable options to antidepressants and sedatives for mild-to-moderate anxiety disorder’, the study authors suggested. Other than smelling wonderful and being full to the brim of essential oils, lavender is also used in food, cosmetics and herbal medicines. For culinary use, lavender is added to salad dressings, sauces, honey, teas and beverages. The natural and organic compounds found in lavender are in its leaves and flowers, perfect when rubbed onto the temples. Brewing lavender tea is popular when trying to lower stress and anxiety levels but is particularly beneficial to those who suffer from insomnia or sleep apnoea. Due to the flower’s calming impact on the nervous system, lavender has been used to induce sleep and relaxation for thousands of years. In a randomized, double-blind, placebo-controlled trial (the gold-standard in scientific evidence) 539 adults with generalised anxiety disorder (GAD) received 160 or 80mg of lavender oil tablets orally or a placebo once daily for ten weeks. The lavender oil was shown to have an antidepressant effect, and improved general mental health and health-related quality of life. And 70 per cent of those taking it achieved full remission of their anxiety and 85 per cent got relief from their insomnia. 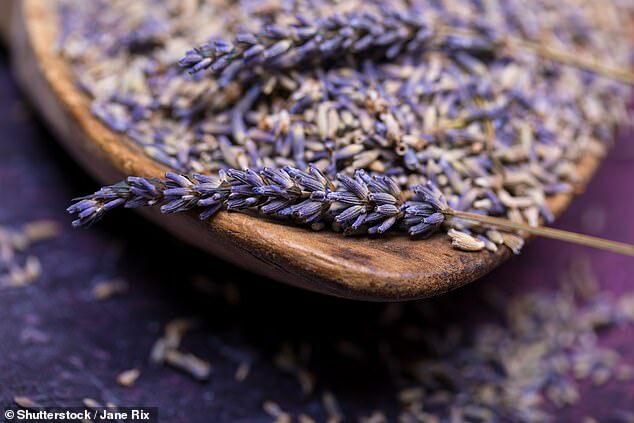 Another study aimed to analyse eight cases, looking at the effectiveness of lavender oil for patients with symptoms of anxiety and insomnia. In six of the cases, lavender oil reduced agitation and psychological anxiety was reduced in five. Much research has found the mineral magnesium has significantly decreased cortisol levels. Cortisol is a steroid hormone responsible for the body’s stress response. Magnesium levels can be increased by eating magnesium-rich foods, such as leafy greens, nuts and seeds. ‘The well-researched mineral, magnesium is known to help in reducing prolonged stress and improving sleep patterns,’ says Hay. Stress can deplete the body of magnesium. This mineral is associated with many chemical reactions in the body, and is required for muscle relaxation and energy metabolism (converting food into energy). Supplements have been shown to help reduce irritability, depression, anxiety, bloating and tiredness, and may help ease painful periods associated with PMS , as well as aiding sleep and constipation. 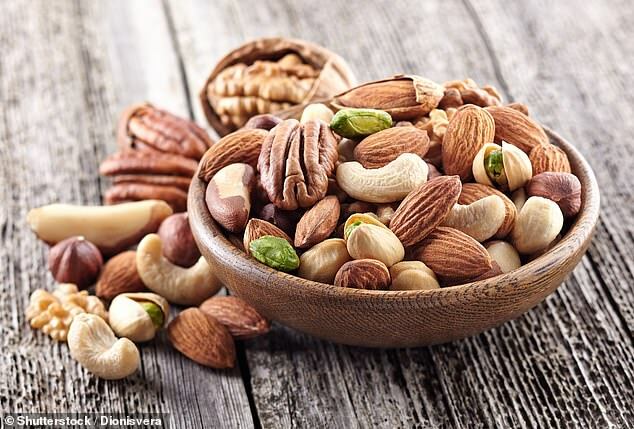 However, The National Diet and Nutrition Survey has shown that 50 per cent of teenage girls and 11 per cent of adult women do not get enough magnesium in their diet. Positive neurotransmitters in the brain such as serotonin are regulated by magnesium and such neurotransmitters are essential to a stable mood. ‘Magnesium has a role in hormonal regulation and can help blood sugar balance and improve mood issues such as depression and anxiety,’ says Hay. A study in the journal of PLoS One found adults who received 248mg of magnesium a day for six weeks saw a significant improvement in their levels of depression and anxiety. B vitamins are also key when it comes to relieving stress. The chemical processes that take place in the body often require B vitamins. These play a key role in the conversion of amino acids into neurotransmitters. If your B vitamins levels are insufficient you won’t produce adequate levels of serotonin and dopamine (your brain’s essential feel good neurotransmitters). B vitamins are best taken as a complex, but eating foods rich in B vitamins such as whole grains, spinach, kidney beans, chickpeas, lentils, quinoa, salmon, tofu, eggs and pecan nuts can also help. Long-term stress can often result in symptoms such as jaw clenching and teeth grinding, and tensing muscles around the face has been associated with lowered levels of Vitamin B5. Vitamins B1, B2, B3 and B5 are central to the energy production process and can’t be made by the body, so we need to add to them from food or supplements. ‘Indeed, the more stress you’re under the more B vitamins your body may be using up,’ says Hay.